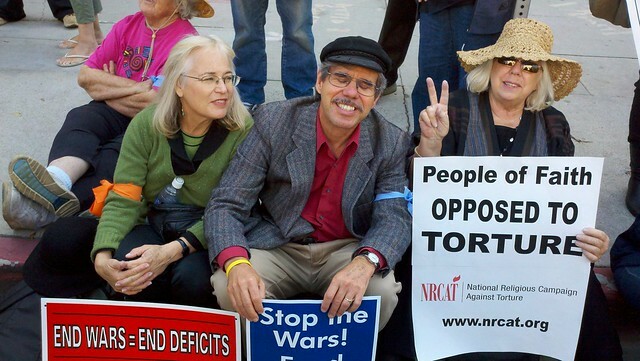 Friday was the tenth anniversary of the U.S. war on Afghanistan and in the morning the Interfaith Communities United for Peace and Justice led a big march against the war endorsed by almost fifty progressive organizations in Southern California, including VFP, PDA, ANSWER, NLG, AFL-CIO, & Code Pink. ICUPJ was formed right after 9/11/01 and is just about as old as the war. 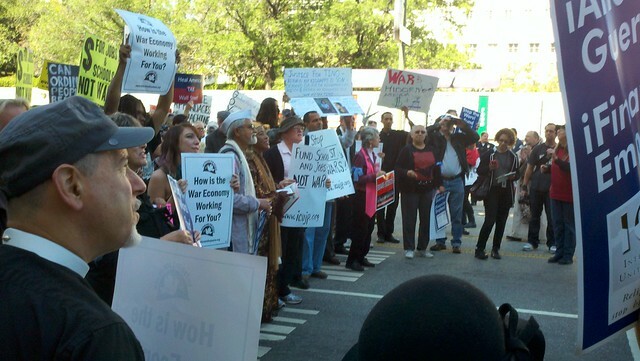 The demands of the march were to stop the wars and fund jobs. 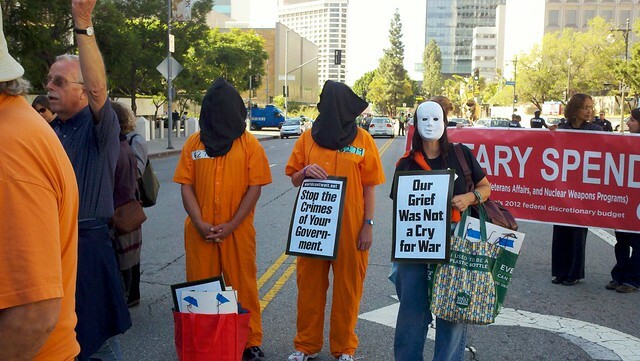 They asked that all troops and private contractors be removed from Iraq and Afghanistan this year, that torture be stopped both at home and abroad and they called for an end to drone attacks targeting civilians in Pakistan and elsewhere. The march started with interfaith prays and gathering at La Placita Church, 535 N. Main St. and proceeded to the downtown Federal Building where a rally and planned civil disobedience were held. 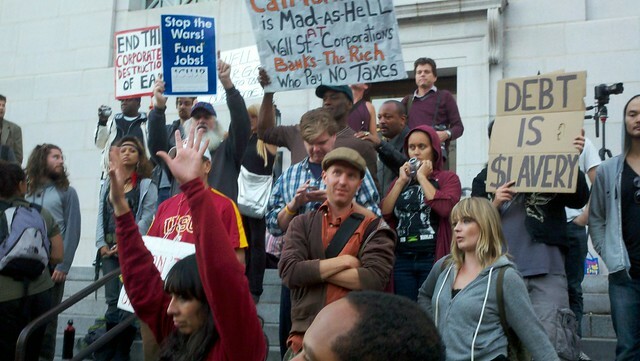 On their way, the marchers passed city hall where Occupy Los Angeles joined them. 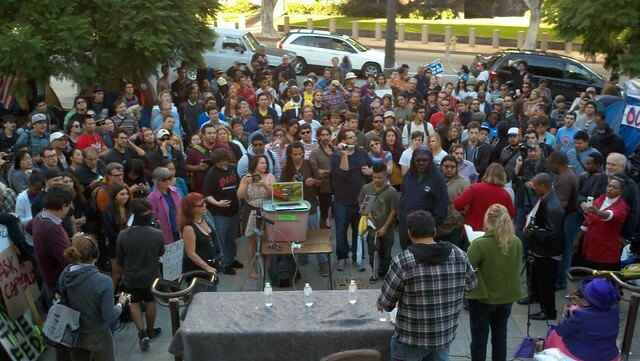 Then hundreds of people from Occupy Los Angeles and ICUPJ rallied in front of the federal building on Main St. 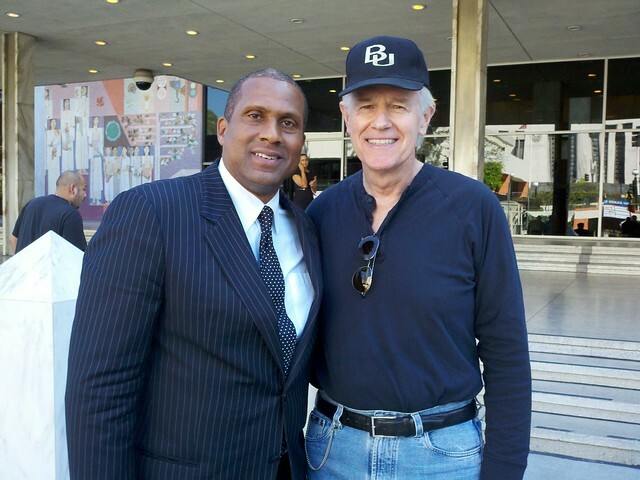 The speakers included actors Mike Farrell and Mimi Kennedy and Professor Cornell West as well as representatives of the organizations supporting the rally. 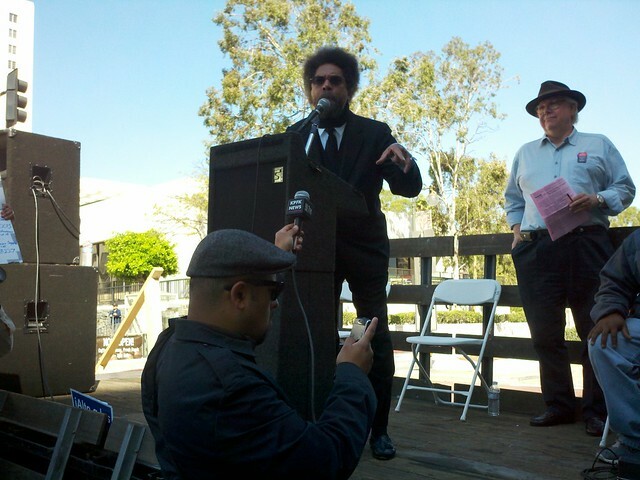 Tavis Smiley and Cornell West paid a visit to Occupy Los Angeles latter in the day. Keith Olbermann was expected but never did show up. 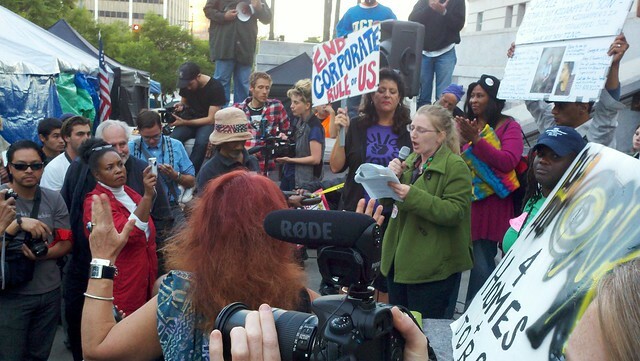 At the end of the rally 14 members of ICUPJ were arrested in a well orchestrated act of civil disobedience. There were far more police at this rally than had been around the city hall encampment because they had been notified of the plans, but they hung back through most of the rally. 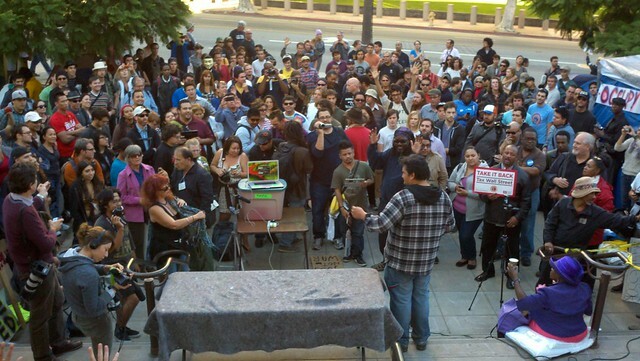 When the time came, they moved forward and told everyone who didn't want to get arrested to move to the sidewalk. 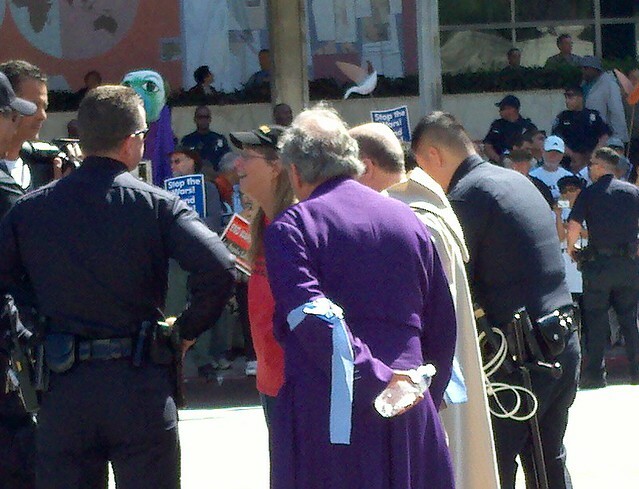 Those that planned to be arrested formed a line across the street and linked hands. 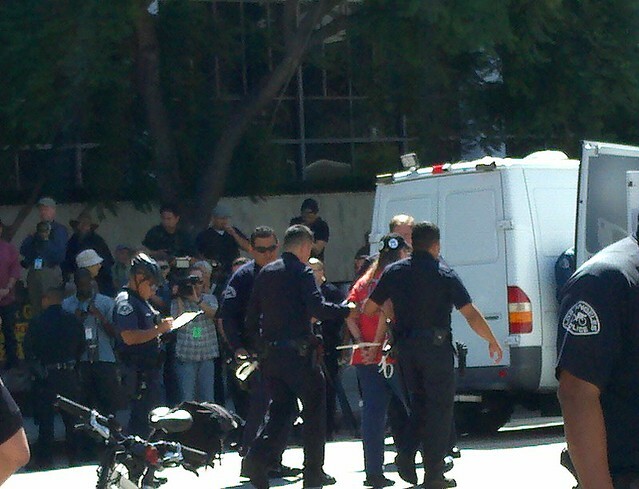 Then the police video teams moved forward to record each arrest as the protester was informed of her or his rights, placed plastic tie-wrap handcuffs and led to one of two waiting police vans. Jim Lafferty from the National Lawyers Guild observed everything to make sure no ones rights were violated. Journalist from around the world are beginning to show up. Cindy Sheehan and Camp Casey were so successful, in part, because there were a lot of bored reporters that had to be in Crawford, TX anyway to cover Bush on vacation and it hasn't hurt OccupyLA one bit that it is about a block south of the international satellite truck parking lot that is covering the trial of Michael Jackson's doctor. Finally, there are lots of meetings. The General Assembly meets at 7:30pm every night and usually go to 9:30 - 10:30pm. Breaking out of third person for a bit, I have a facilitators meeting at 5:30p and then the GA @ 7:30p which lasted till 9:30-10p, then a brief facilitators summation after that. That's my standard drill. A number of other committees have meetings at 5p or so. There are a lot of committees and most people are on one but the meeting times vary. About 300 occupiers in 120 tents are spending the night these days but I'm not one of them. 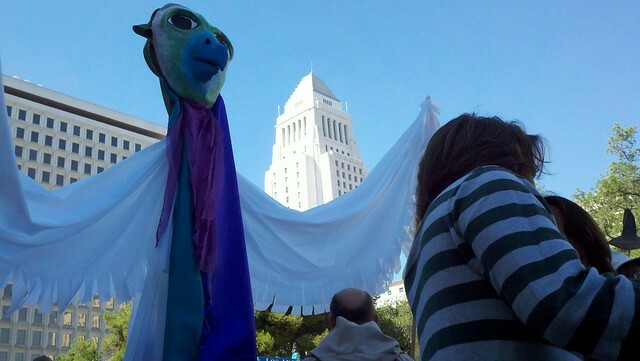 The Metro 733 bus has a stop two blocks from my place in Venice and has another stop at city hall and I make use of it. When I get home I finish my diary and sleep. I want to finish this one before 2am. Wednesday night I was in a very important meeting that didn't break up until after 1am and I missed the last bus. Fortunately a comrade drove me back to Venice. 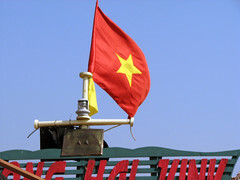 But that meeting went a very long to resolving some contradictions that had been boiling under the surface of every previous occupation GA.
As a result the last two GAs have gone much smoother and gotten more real work done in less time. This is important because our 7:30p GA is more and more being attended by new people and the media and so we want them to be spirited, interesting, efficient and as tension free as possible. 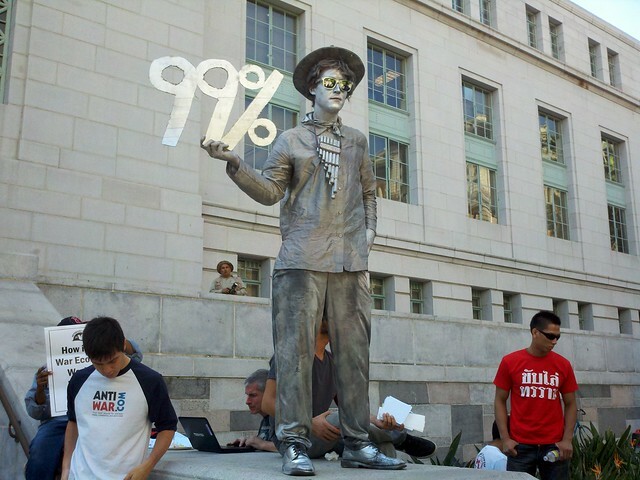 We want these meetings to example our best and invite the 99% in. The more sticky problems can be taken up by the people most concerned at other times, at 1am if necessary. We are all operating on very little sleep and a lot of energy. 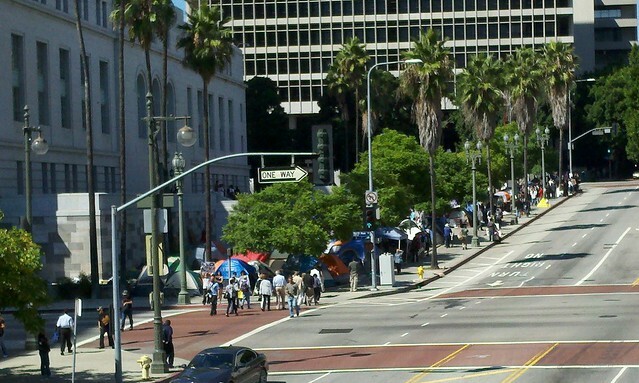 Occupy LA is developing at an incredible rate, in every sense of the word. I can't even keep track of the unions that are supporting us. Supplies are coming in from all over the place. We got another 4G account and are setting up public wireless. More and different workshops are going on or being planned. I plan to lead one on Linux, probably next week. Today I heard Sony is letting us use a 40ft. 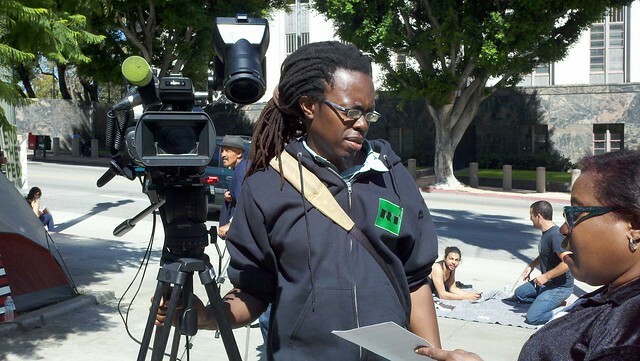 editing trailer and someone else is setting up satellite downlink so we can see ourselves on the news at Occupy LA. And we have already planned actions out to October 16th. We plan to be here for a while. 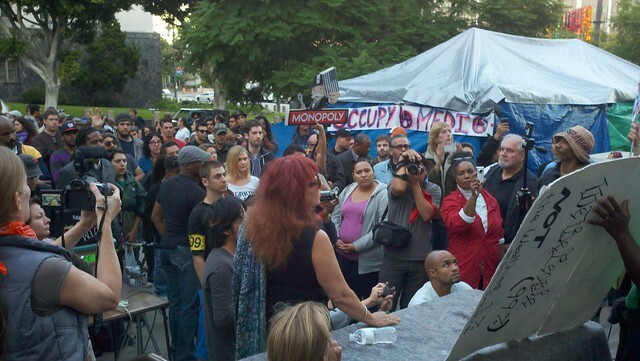 Be sure to visit the Occupy LA website for daily up dates and more. Today is Saturday and it's going to be huge. I'd better get some sleep. I've got to be back there in six hours.